← Life at Halifax Provincial Court. A court reporter scribbles in his notebook. A murder witness points to a crime scene on an enlarged photograph; his voice falters when he is asked to recount the final moments of a man´s life, and how that life was so brutally taken. Thanks Jacqueline, though I´m not sure beautiful is the word you would have used if you had heard the details. The courtroom is a public place as far as I know, no cameras allowed, not sure how it is in the states? Russell. No, I’m sure it was terrible to hear, but I mean your story of the scene was beautifully, touchingly told (words and picture). And yes, come to think of it, we’re probably allowed to go into courtrooms too. I’m glad you’re braving it! Yes, the stuff of nightmares. Russell. Great details, Russell – a lot of stories and emotion going on here – I like it. Have they offered you a job as the court illustrator yet? Thanks Jo. I managed to get one commission so far, hopefully more will come along. Russell. I’m in love with the motion of this drawing! Thank you for noticing, that´s something I try to work towards, getting motion and life into the drawings. Russell. A beautiful little story. I love the witness hand motion. 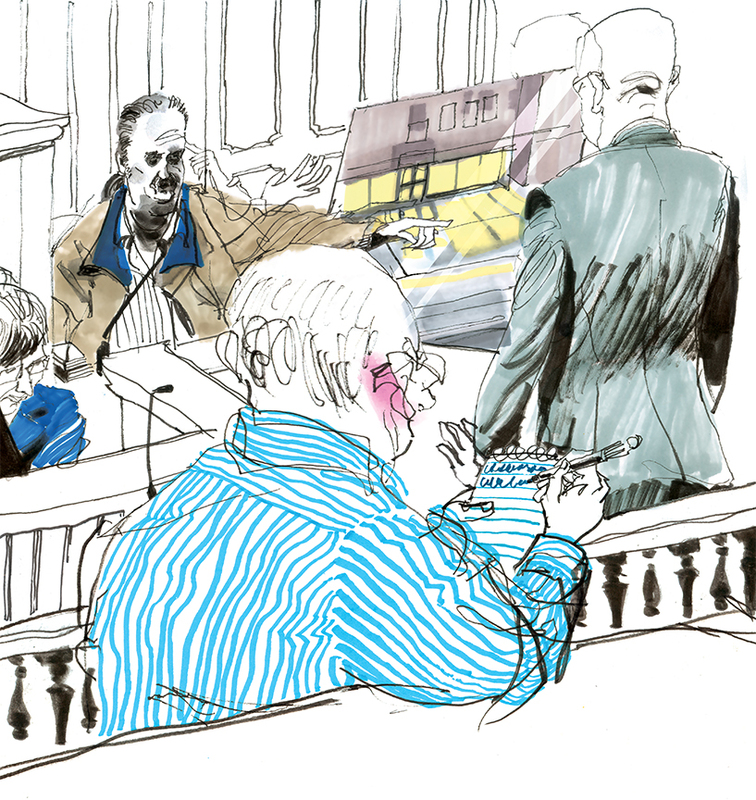 How do you get to actually be inside the courtroom?